There is a saying that the apple doesn’t fall far from the tree. You couldn’t prove it by me. One of my daughters lives in Beijing and writes like T. S. Eliot, another is an anti-vaccination activist and fashion designer with a Tyrannosaurus-sized Great Dane. My son is the CEO of a company that produces a line of vitamins that can turn a bag lady on Thorazine into a Dallas Cowboys cheerleader. They each have their own entrepreneurial DNA. So I would reject the maxim out of hand, except for the family Ries. Al Ries is the godfather of positioning – the marketing technique that enables a brand to achieve instant familiarity and stand out as unique. The book he wrote with Jack Trout, Positioning: The Battle for Your Mind, is not just a classic, it introduces the marketing technique that should be the basis of virtually any communication strategy. Advertising Age, the bible of the advertising industry, asked their readers to name the top media and marketing book of all time. Number one? That’s right, Positioning: The Battle for Your Mind. Trout and Ries co-authored some other books, and later went their separate ways. Al Ries, then brought his daughter, Laura, into the family business and the two of them have written several books together on marketing and branding, including the groundbreaking, The Death of Advertising and the Rise of PR. 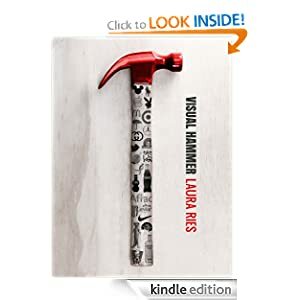 Laura has become one of the county’s leading branding experts in her own right, and just released her first solo book, Visual Hammer – Nail Your Brand into the Mind with the Emotional Power of a Visual. Those of you that are familiar with my marketing work know that I have often written about the importance of visuals in any communication campaign. https://www.ontargetresearch.com/2012/04/04/images-and-effective-advertising/. Laura Ries does a wonderful job making this point with a tsunami of examples from virtually every industry sector imaginable. My love affair with the marketing genius of Al and Laura Ries is dimpled with the fact that they are under the misapprehension that the mind is the brain – that mental image pictures are stacked on one side of your brain or the other in some psychologically pre-set manner. While there are certainly different kinds of thinking that one can categorize in one way or another, thankfully, the mind is not a bodily organ. Meat doesn’t think: you do. But the message of Visual Hammer is not marred by this misunderstanding, and Laura Ries has hit a home run here. Meanwhile, if your brand does not have a positioning image and accompanying tag line, you are missing the most vital piece of marketing technology available today; you are missing the opportunity to drive your brand into the mind of your public in a powerful and lasting way. At On Target Research, we do proprietary surveys that will position your brand so the marketing angels will sing and your bank account will hum in harmony. It’s a touch of survey magic. “…the positioning that grew out of your research was nothing short of stellar!” JD President and COO.